The second day of the Beer Academy “Advanced Course” is intended to extend on the material in the Day 1 “Foundation Course”. You can do just the second day as an addition to having already done the Foundation Course in fact, thus spreading out the cost over time (I’m not sure what the separate prices are). We had one additional chap join us for just the second day, he’d done the Foundation Course a year ago and came back for more! He’s a beer enthusiast based near Birmingham, currently working for SpecSavers but with an eye to getting into the beer scene. I felt the second day flowed more smoothly than the first – perhaps mainly because everyone was more comfortable as we’d had a chance to get to know each other now, Derek included. It also helped that Derek’s slide order did follow the syllabus order fairly closely. We started off with brewing inputs and dove deep into water sources and water treatment. As a newbie homebrewer who hasn’t got into water treatment yet this was incredibly useful to me. Hopefully I retain enough of the info to ease my own future use of water treatment. Malting is also comprehensively examined – from the practical level of barley varieties and seasons through to the deeps of chemical composition, conversion, and flavour analysis. Adjuncts are neither missed nor dissed, their use and value to certain styles is part of the course. Flavourings and the history of their use gets a quick look-in, with more specific coverage later when we examine styles. All of this comes with a richness of added historic notes from Derek, like the use of potato flour in brewing at Tolly Cobbold! What am I missing? … Hops! 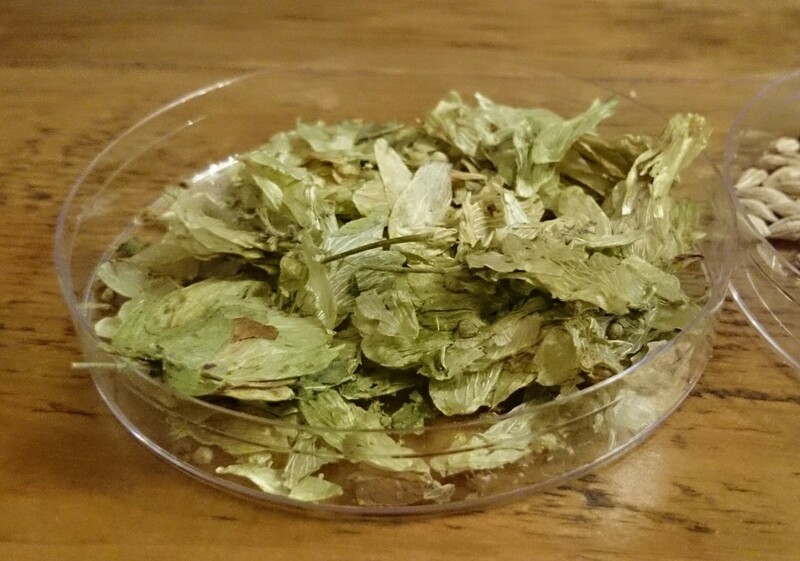 Not left out of course: again, much more technical coverage – acids, oils, and IBUs – and more about a range of specific varieties, uses, and different hop products used in brewing. As previously mentioned the mashing process is covered – explaining the different enzymatic/chemical stages of the mash. This is well illustrated in the coverage of the decoction mash. Temperatures, fermentables, unfermentables… and from this logically onto yeast, history, strains, and styles of secondary fermentation. Sterilisation – pasteurisation and sterile filtration next. Here we learnt that where our Brazillian brewer used to work they sterile-filter AND tunnel-pasteurise. I never did get around to asking where it was she was working in Brazil. By now, it being about midday, we start to explore tastes and styles. With a series of beers in hand of course! We run through a variety of taints again, more of a re-cap of Day 1 really. Then dive into further detail about flavour descriptors and systems for presenting them – i.e. Cyclops. The exploration of beer styles went wider and whilst I am at least casually acquainted with all styles from the drinking perspective I learnt more about their relationships and histories. Derek seems to be familiar with a vast spread of European brewing and had been to and met many great brewers and breweries… so again the value-add of his presence was significant. The final set of beers we tasted included some basic food matches as well. Some working better than others – having degrees of both success and failure in the matching was a good touch (I don’t know how deliberate it was!) Pairing Innis & Gunn Original with Apple Pie was, for me, terrible. The majority were not keen on the pairing – however the vast majority gave the beer a firm “thumbs up”… so there you go. Tasted like lollywater to me. 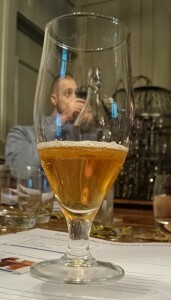 Derek led the matchings well – and has done beer and food pairing in the past, so it isn’t like they have just grabbed a master brewer who only knows the beer from the brewing end… he’s incredibly enthusiastic about beer and food pairing. As with Day 1 we finished up with a fairly informal 20-question multi-choice exam. No great challenge. I’d liken the whole exam element to having done my “Life in the UK” test. Study some material and then do what is effectively a memory and comprehension test. 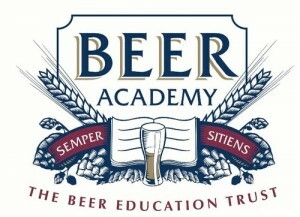 I reiterate here that the Beer Academy puts this course forward as being about education, not examination. I expect anyone doing it is going to be there with a serious interest in learning, as was certainly the case on the course I attended. Just being there is a qualifying activity in my view. 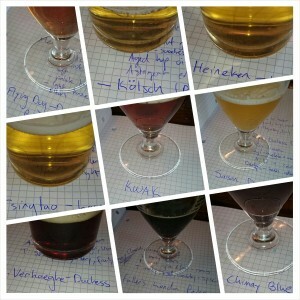 All in all Day 2 had a lot of value in it for me – as both a homebrewer and drinker. I’d certainly recommend it to anyone with a keen interest in homebrew who is not already well versed in the finer details of full mash brewing. Although a more purpose-designed brewing course is probably more relevant, so it helps if you’re interested in the wider world of beer as well. Everyone seemed to go away from the course happy for the experience. The majority of my fellow students dispersed quickly at the end, but those who stayed around were upbeat and happy with the experience. Even the proper brewers. We shared a couple of beers downstairs in the Bull and had a chat. Everyone has beery activities planned for the evening… ah, a proper beer crowd. We finished our beers and headed in our separate directions… Derek to the Wandsworth Beer Festival… others to different parts of London with must-see bars in mind… and me down the road to the Southampton Arms. A fantastic little pub and a pint of Magic Rock Rapture in the BEST condition I have ever found it – NBSS 5/5 material… beer… it’s wonderful. This post, yesterday’s write-up of Day 1, and the previous introductory post all form a “log” of sorts. “Web Logging” as originally intended? 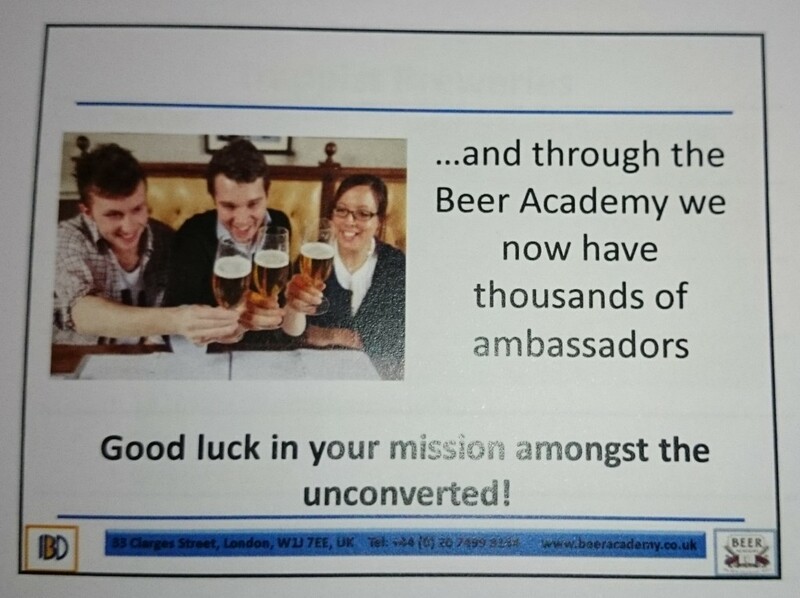 The idea is to give a “live” overview of doing the Beer Academy “Advanced Course”. I’ve glossed over some bits, and obviously cannot cram much detail of two 09:30-16:30 days of learning into a reasonable number of words. I will write one final post on this topic which will be more of a rounded overview and review of the experience. Watch this space… well, not *this* space exactly… ah, you know what I mean. 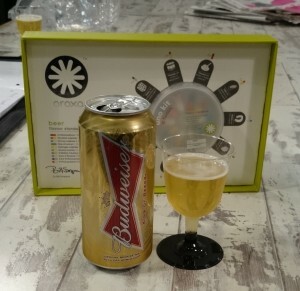 So, here’s my write-up of Day 1 of the Beer Academy “Advanced Course“, which is equivalent to the 1-day NVQ-Level-1 credited “Foundation Course“. 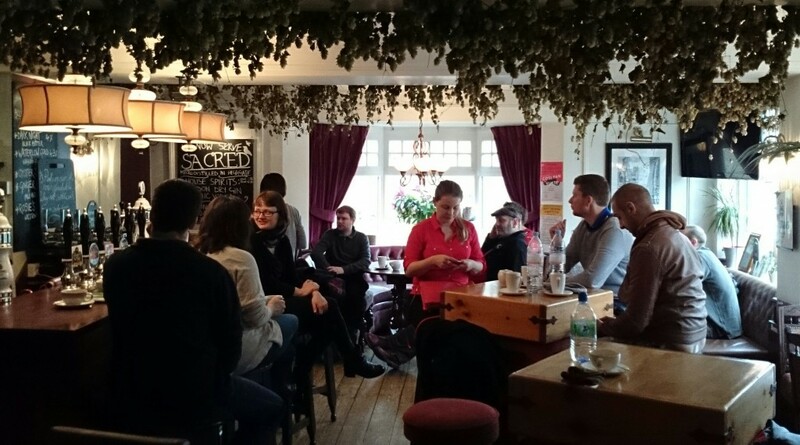 The session I attended was conducted at The Bull in Highgate on 25/26 March 2014 and it is led by Derek Prentice – a Master Brewer who has been in the brewing industry for over 40 years. Starting out at Truman’s, and ending up at Fuller’s via Young’s. He has retired from Fuller’s now but has an eye out for picking up something in the burgeoning craft micro scene – with an ideal being a combined brewery, smokehouse, and bakery! Sounds wonderful to me. Without a doubt Derek is a lover of beer and extremely enthusiastic about all aspects of it – especially when talking about some of the finer details of ingredients and brewing. He is an engaging speaker with a bulk of knowledge that lets him riff on a point in a slide for minutes before realising we’d better catch up with our course schedule. The “class” is made of up 15 “pupils” harking from a variety of backgrounds. Five from the beer/events industry, two with plans to go into the pub trade in Brighton, two with a brewery in Ireland, one setting up a brewery in Yorkshire, two “simply” working in bars, one professional brewer from Brazil looking for work in the UK, a chap there because the course was a birthday present, and me… whatever I am. That was a mouthfull. A very wide spread of knowledge levels represented here, which makes me wonder how the course can offer “something for everyone” to such a group. We are all given a printout of prepared slides that do not seem to have been prepared by Derek and on top of that his projector copy is ordered differently from our printed copy. I’m not one for following printed slides myself – but this did cause a bit of confusion and frantic page-flipping in the room. However Derek was clearly more than familiar with the content and led the show from his deck pretty fluidly regardless. Very good going given it was only his second time running the course. The content is broken into modules that are interspersed with some beer tastings and beer and food pairings. From the slides alone the content doesn’t touch much that I’m not already familiar with but Derek makes up for this with the added value of his own experience and stories. To begin we cover the basic ingredients of brewing. Water and its properties and adjustments. 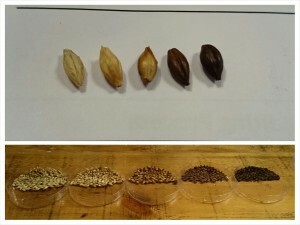 Barley, the malting process, and the varied flavour contributions of malted barley. Adjuncts and similarly their value in brewing and flavour. And finally hops – well covered for a complicated subject. Interesting bits of information about hop growing practices and history too… with morsels from Derek such as US growers not growing any male plants due to a dislike of seed production versus UK growers deliberately including males in order to result in seed production and thus cause the cones to close and reduce risk of mould issues. Climatic foibles! Derek also had a fun note to add about the yearly “Hop Shoot Day” where brewing folk gather and do something with the new season’s shoots… and that last year they tried a high alpha variety with little culinary success. 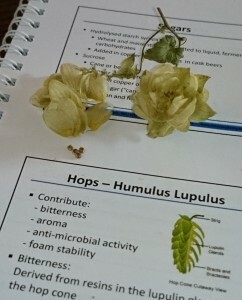 Thus learning that hop bitterness properties affect the entire plant. As is typical in these situations we were able to observe, feel, sniff, and even taste a variety of malts and hops. This continued into the brewing process including yeasts… which is much what you’d expect if you’re familiar with brewing. Subjects cover backyard micros through to industrial level beer production. Various conditioning and packaging processes are covered – not in any way cask-centric either. Unlike experiences within CAMRA this course is all-inclusive… multinational brands lager brands are not shunned, or even despised – except where, perhaps, deserved. Objectivity is key however and cask also can go wrong and there are no kid-gloves for the cask industry. From production we lead into history… which you could call “the usual suspects”. Beer versus ale, hops, barely touching on gruit, middle age brewing through to UK industrialisation and pale malts, and from there the spread of modern beer across the world. Quote time, regarding clear glass: “We tell them to bugger off, but they don’t believe you. 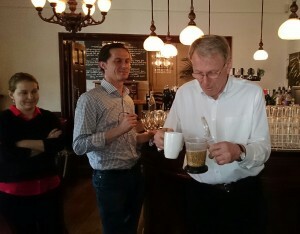 Then you do a taste test and they *still* don’t believe you!” – Derek Prentice, Master Brewer. From beer tasting and matching we lead on to fairly comprehensively, although speedily, cover core beer styles with respect to Europe but lacking an eye to the colonies. As much as I hate it a bit of an BJCP injection here would be educational… especially as it has increasing influence on local UK brewing, not just imports. Some history content comes in here of course and I learn a few things about the travel of brewing around Europe as a result. The final part of the day deals with the on-trade – beginning with stats about the dire state of the overall market. Cask and keg are given equal treatment and matters of cooling, cellar management, glassware handling and selection, and staffing are all touched upon. We wrap up with some more stats and an industry overview – with the upbeat message that beer is good and to go forth and evangelise our favourite drink. To cap off the day we all complete a 20 question multiple choice paper, hand it in… and our certificates should be in the post. All very casual… and Derek makes the point that the course is intended to be an educational experience, not an assessment. 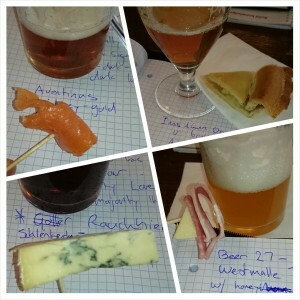 Day 1 completes the Beer Academy “Foundation Course”. Day 2 will apparently revisit the same areas but drill down to a greater level of detail (at the time of writing I’ve done Day 1 and am still do to Day 2 on the morrow). I’m looking forward to it… whilst Day 1 was fun it was far more confirmational than educational. There were few points of new data for me within the syllabus but this was more than made up for by Derek’s personal tales and input. I leave you with a Derek quote on the subject of sparklers: “Northern bloody things”… a sentiment with which I find myself agreeing… but I will continue to try and grok them in the name of personal education. I’m due a trip up north soon. In pursuit of further motivation and confidence I booked myself into the Beer Academy’s “Advanced Course” a couple of months back. These courses are popular, you need to book a couple of months in advance if you want to be sure of doing a given date. Whilst the information about it on the website is rather vague – based on what I’ve heard about it the course seems a logical step in continuing my education in beer. The cost of the course, including VAT, is £312… perhaps high if measured in pints of beer, but in a better perspective: less than a decent weekend away. The Cicerone programme seems, on the face of it, to be far more thorough and organised than the Beer Academy qualification – although this could be amplified by the more detailed and better presented online presence of the Cicerone website. I expect the main downside of Certified Cicerone is that it would be, unsurprisingly, US-centric… thus probably not covering cask ale and UK styles and practices to to a depth appropriate for someone in the UK. OK, so that is probably not so much of a setback to someone working in BrewDog bars and I wonder if the Cicerone programme does have a real advantage in the context of more craft-led establishments. I figure it’s obvious that BrewDog believe so. It’ll be interesting to see if the concept of craft beer is covered by the Beer Academy, or even just newer/less-traditional beer styles. Cost-wise the two appear similar – but note the Cicerone headline price is purely for an assessment that is probably best preceded with some training or industry experience. It also seems likely to be necessary to fly to the US to complete the assessment as I see no European dates on their calendar… I thought I’d heard about exams in London but that may have been specific to BrewDog staff. I’m not really in a position to rate the value of one over the other. Just noting that I’m aware that there is another option and explaining why I’m not pursuing it instead. 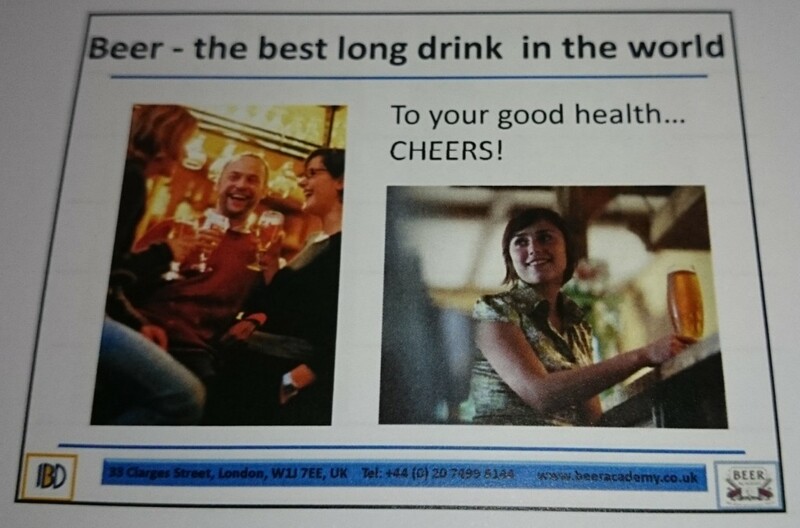 The Beer Academy course is “NVQ Level-1″ which I presume has some meaning and interest to bar staff in the UK. I really don’t know – feedback from UK barfolk on this would be much appreciated. For my purposes the Beer Academy course seemed the logical choice given it will likely be a tight cultural fit to the UK beer scene. It also helps that I can simply pop down to London to attend. That said, I’d love to do at least the “Certified Beer Server” stage of the Cicerone programme as well some day… and not just because I think the shiny badge would look mighty purdy on Colin. I suppose I began my own casual beer matching by 2010. Since then have experimented extensively in cooking with beer, dangled a foot into the world of homebrew, and have gone as far as learning some cellarmanship skills and torturing my palate. Outside of the CAMRA bar management course this has all been informal “play”, fun but shooting in the dark a bit. So the time has come to see how the subject matter is dealt with in a professional context. Perhaps I’ll also find some new inspiration along the way. The course I’m doing is hosted at The Bull in Highgate and runs from 09:30 to 16:30 on Tuesday and Wednesday mornings. The next decision to make after booking the course was whether or not to commute down to London from Cambridge both days or stay a night or two in the big smoke. A month prior to the date hotel pricing made the latter a definite no-go. But on Sunday, two days before the date, a LateRooms search came up with the goods – a B&B room in New Market House for a total of £112 to stay Monday and Tuesday nights. This stroke of luck meant I could book a return train ticket for £34.50 rather than two daily peak-return-with-travelcard tickets for £92.60. Ah… affordable public transport? Anyway – the overnight stay means I can take the healthier and more casual option of walking rather than the tube/bus sardine experience. Not bad it only costing £53.90 extra to be much more relaxed, happy, and not a sardine. New Market House is just under a mile from Kings Cross station and The Bull is a about a three mile wander from the B&B. It’s a good thing I like walking. I dare say the location also means I’ll be popping my head into the Southampton Arms and BrewDog Camden, at the least. 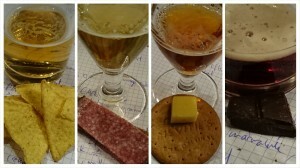 I’m planning on writing some notes about the Beer Academy course over the next couple of days with an intention to post a brief impression of each of the two days and follow that with a brief post-digestion summary. The aim being to avoid the usual 2000+ word wall-of-text I’d normally generate for this sort of thing. Stay tuned… if interested.